If you had one wish, what would it be? Maybe you'd want to travel to the top five places on your bucket list. Maybe you'd wish to sit and talk with the ghost of Abraham Lincoln. Or perhaps you'd want to break a world record and live on through history. No matter what, all wishes have their twists in one way or another. Maybe you get to go to all five places on your list but you have to bring your aunt that can't stand foreign food along and constantly talks about her motion sickness symptoms. Maybe you break the world record for hot dog eating but you'll have a case of heartburn that will last a full two-years. And oh, if you do get to meet the esteemed Abraham Lincoln, what would you do if he didn't actually like you? That would sure be awkward! What's our point? Well, the lesson the Meeseeks teach the Smith family is a classic one we should all remember. 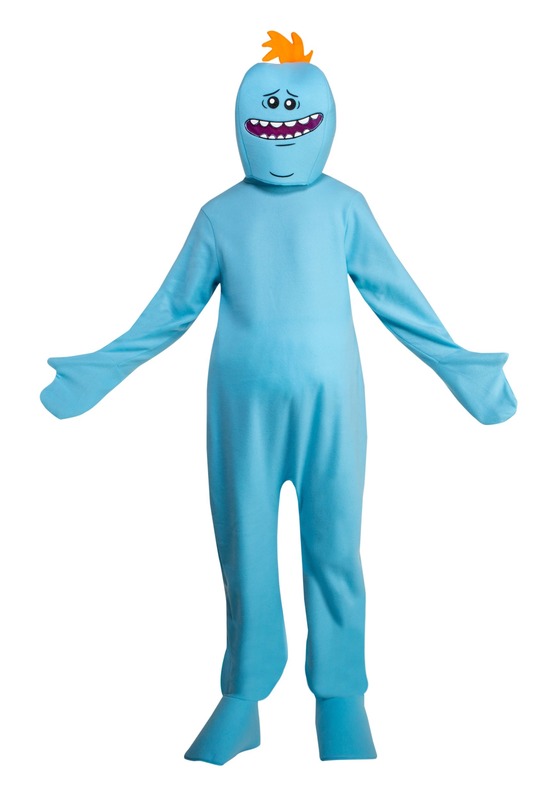 This license Mr. Meeseeks costume features a bright blue bodysuit that will transform you into a desperate, people pleaser in an instant. The bodysuit is topped with a Meeseeks mask, so any Rick and Morty fan immediately recognize your character. While episode five of season one persuaded us away from pushing any buttons on a Meeseeks box, we think this costume could solve all our boredom problems! Going out solo? You know the Mr. Meeseeks catchphrase. Want the perfect costume for a large group of people? The more Meeseeks show up at the bar, the funnier it'll be for the people that have seen the show. Better yet if a few of the characters look like they've been through the wringer. So, get in touch with your helpful side and transform into the legendary Mr. Meeseeks.